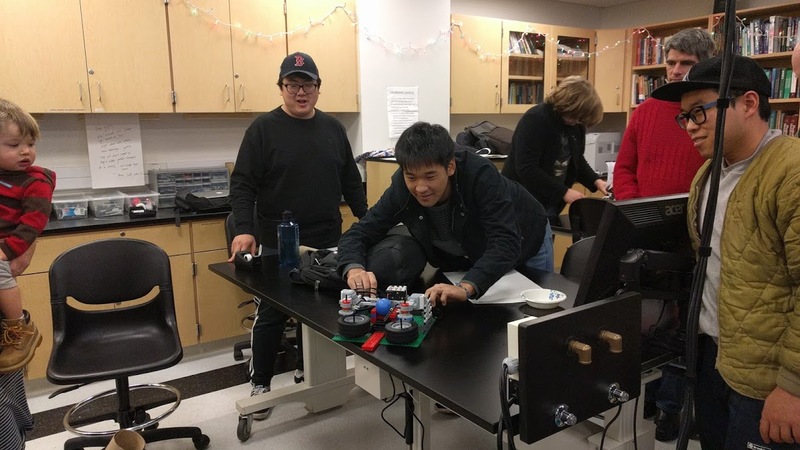 Using the programming and engineering skills they have accumulated to date, first-year engineering students were given the task of creating a Christmas toy. Their instructor Dr. Jessica Ventura structured the project conditions—a mere six days to create a working toy with whatever resources can be found in the lab—to give the students a taste of a post-Gordon work environment. They rallied and came up with what Dr. David Lee, director of Gordon’s 3-2 Engineering Program, deemed “exceptional” projects, ambitious in creativity and size. Many even went the extra mile and presented their creations in Christmas giftwrap, much to the delight of the event’s “assistants,” Dr. Ventura’s toddler sons. James St. Julien claimed “Toy of the Year” honors for his Technics 4-beam-shooting tank that combined design, practicality, interactivity and a dual-barrel machine gun. Other creative toys included Hyung Gyu Park and Josh Claxton’s three-speed pitching machine and Emily Gima’s creepy spider. Another super-group of first-year students—Jeff Davis, Justin Masterson, Mike Patoto and Joe Sherratt—created a fully functioning miniature crane complete with wrecking ball, perfect for junior engineers. The palpable interest of Dr. Ventura’s son in the technologically-powered toys created by technologically-minded students evidenced Dr. Lee’s words. And while we may be technological beings, the younger among us want nothing more than a fun toy to unwrap for Christmas. Sometimes that toy is created by a Gordon College engineering student.